As we all do, I've now moved onto a different set of tried-and-true recipes. But recently I revisited my old stomping grounds for one evening and dug out a recipe for tuna burgers that I used to make all the time back in the old days -- both as sliders for cocktail party gigs and as normal, human-sized burgers for dinners with friends. I came across the original recipe in a Williams-Sonoma cookbook called Fresh & Light and fell in love with its clean, fresh flavors. 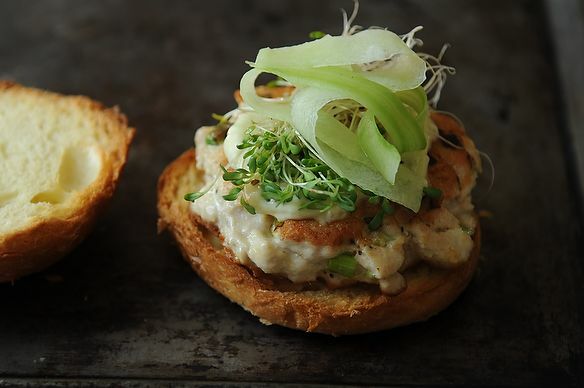 Chopped sushi-grade tuna is mixed with fresh ginger and scallions, molded into patties, pan fried and then topped with cucumber, sprouts and a zippy pickled ginger and wasabi-infused mayonnaise. I've altered the proportions over the years, upping the wasabi and fresh ginger, and I use a full egg instead of the recommended egg white, as well as regular mayo rather than fat-free. Instead of stopping at medium-rare, I like to cook the burgers just through -- I find that a little bit of heat makes the ginger and scallions really sing. And finally, I serve the tuna burgers on brioche rolls instead of the sesame bagels called for in the original -- they make for a much more delicate burger, and their richness is a nice complement to all the clean, fresh flavors. Love all the ginger in your version, Merrill! I have another version at ravenoukitchen.com that's a little more complicated, but a favorite at our house. Can't wait to try yours. Thanks! I'll have to check yours out too. Prepared these tonight. Rave reviews. How do I get a cool badge like you guys in my comments? "David is food52's biggest fan." We'll let you know when we implement that particular badge! You have inspired me to revisit this terrific recipe - I have that cookbook too! A fellow fan! Nice to know I'm not alone. Ay yi yi. This is the new best thing I've ever heard of. Mini-sesame bagels sound hilarious -- fully in support of the switch to brioche!